Arguably the biggest news out of CES 2019 was Apple's surprise embrace of the TV industry with four major manufacturers announcing the integration of key Apple features into their sets. LG, Vizio, Sony, and Samsung all announced support for AirPlay 2 and Siri on some recent TVs while all but the last introducing support for HomeKit. Immediately after the news emerged, social media was rife with potential customers evaluating the purchase of a new model -- even before solid information was available about what HomeKit can and can't do. So, while we await software updates, and the release of the promised new models, let's talk about it. TVs are now an entirely new category in HomeKit, which means they don't show as solely as a simple speaker or Apple TV. They have their own properties and characteristics exposed to HomeKit. Speakers, for instance, you can just turn up/down as well as play/pause. Alternatively, TVs have many more options within HomeKit. To start, you can turn your set on or off or adjust the volume all the means you interface with HomeKit now, including Siri. Changing the input, controlling the brightness, and setting the picture mode or media state is all possible through HomeKit as well. This opens up so much more, especially if can be integrated into scenes. Taking things even further, normal remote functions can be carried out through HomeKit with key simulation. So if there is something the TV needs to do unique, it is possible to expose those keys for use, negating the need to ever grab the manufacturer's remote ever again. This is possible with the Apple TV now -- to some extent. There is limited HDMI-CEC information transmittal back to a television through the HDMI cable to a compatible television, but the implementation is spotty. Speakers, as mentioned, really only can have their volume and media state controlled through HomeKit. They can't be integrated into scenes like other accessories. This is very limiting to users and high on our wish list for June. TVs, on the other hand, have many more properties that could make more sense in scenes -- but, as of yet, specific information on what can be done is limited, and vendors at CES itself weren't talking about it. But for now, your bedtime scene now doesn't just turn off the lights, lock the doors, close the garage, shut the blinds, and turn down the temperature. It should be able to do all that plus shut off your TV without relying on a HomeKit socket. Maybe a "movie time" scene will be able to dim the lights and turn on the TV. A "Night mode" scene may be able to turn on the TV and turn the volume to a less wall-shaking decibel out of respect for others. "Game time" could turn on the TV, set a cool color backlight with the Hue Play, turn up the volume, and switch the input to your PS4. Naturally, there are going to be limitations here on what you can do. The biggest is that this won't act as an Apple TV replacement. Samsung's implementation isn't getting HomeKit -- but is getting the iTunes movies and TV store. Also, the Vizio and LG versions don't have iTunes, and are limited to just AirPlay 2 and HomeKit. The full tvOS experience and all that entails still remains exclusive to the Apple TV. The new TVs also won't act as a Home Hub. You still need an Apple TV, a plugged-in iPad, or a HomePod for this. Having a Home Hub gives external secure access to any HomeKit accessories like lights or locks. These new TVs and updates will be available soon in a variety of sizes and price points. If you're in the market, these would be excellent to consider, whether or not you already have an Apple TV. And, it's worthwhile to see what can be found refurbished from Vizio, given that the company will roll out support for some supporting models back to 2016. Apple has compiled a list on its website to see which models may be getting the update and which new ones are on the way. I think the embrace went the other way. Airplay has always been available to implement by manufacturers even before Apple pushed Apple TV to streaming. It’s the TV players who finally decided they it didn’t make sense to keep making their own non compatible protocols when their are a billion devices that want to stream content via AirPlay. Thanks guys for the rundown! Really appreciate it. I agree w/ your assessment the three biggest annoyances w/ my current TV/AppleTV setup is the multiple remotes needed and having to use the TV remote only to switch the TV on and off. The need to have a sound bar (w/ another remote) b/c the speakers on the TV are so 'tinny' sounding. I don't mind having a sound bar, in of itself. I realize the sound quality of very thin speakers inside a very thin TV is problematic. I just wish the speaker would come on automatically. I guess I would just like everything to work from my AppleTV remote! P.S. I was hoping I could wait for Apple to solve all this with the next release of the AppleTV. But it looks as though their solution is AirPlay two, an AppleTV and two HomePods. Hmmmm. A bit on the expensive side. It would be great if I could use my HomePod’s with my LG OLED. Pick up an Inteset 4-1 remote. They run about $30 bucks and are pretty good at replacing all remotes. I’ve got 4 of them all set up to handle TV, Cable box, AppleTVs, and Sound bars. While no microphone for Siri, everything else works once you’ve programmed the remote. Nice thing is AppleTV is already programmed and adding the others is pretty simple using Inteset instructions. Cheers. The only native remote for any piece of consumer electronic gear I have used is the Tivo remote. Otherwise I'm with @fh-ace - Universal remotes are the way to go. I hope you guiys will post a follow-up article focusing on HomePod integration into these new TV configurations. We currently have a pair of HomePods on either side of a large screen Samsung — but we’re only able to use them when playing back directly from the AppleTV. At present there is no way to play audio from our primary TV provider —- AT&T U-Verse —- over the HomePods. 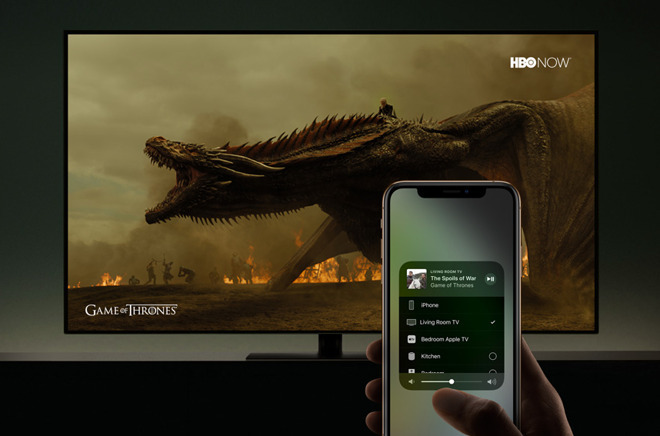 It would be extremely frustrating if that limitation persists once AirPlay 2 is integrated into the TV;. Thanks Fh...I'll look into into it! Actually - I do have to turn the TV on and off via the remote, but I am able to control my JBL sound bar using my Apple TV remote. My Apple TV will also control the TV’s speakers, but I have those disabled in the TVs system settings. (Panasonic TV). I’m not sure what you mean as everything you are describing is already possible with the AppleTV 4. That’s what HDMI-CEC is for. On my Vizio TV and Samsung soundbar, when I press a button on my AppleTV remote, the tv and soundbar turn on, the tv input switches to AppleTV, and the volume buttons on the AppleTV remote control the volume of the soundbar. When I use the AppleTV remote to put it to sleep, it also turns off the TV and soundbar. The same thing happens with my PS4. I do keep the dedicated remotes around because sometimes I might want to do more advanced stuff like change advanced picture settings etc. But if we are talking about turning the tv and soundbar on and off, adjusting the volume, and switching inputs, that is all already possible with the AppleTV 4 and later and its Siri remote. No better than the $30 original infrared remote. Read the article before you flap your lip. Thanks Escargot...perhaps I've been doing it all wrong! Any easy-to-use PIP (picture-in-a-picture) capabilities built into this setup? Not with HomeKit/AirPlay 2 directly. That'll depend on the implementation by the vendor.